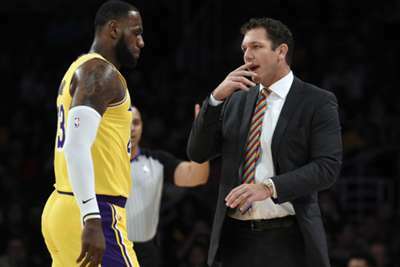 LeBron James came to the defence of Los Angeles Lakers coach Luke Walton after his team earned a big 114-110 road victory over the Portland Trail Blazers on Saturday. Walton has been at the centre of reports indicating president Magic Johnson reprimanded him for the Lakers' slow start after losing five of the first seven games, though the coach later said he was not concerned about his job security and has meetings with management on a regular basis. When asked about how it feels to win amid drama surrounding Walton, James said the 38-year-old always puts the team, who are now 4-5 after back-to-back victories, in a position to be successful. "I mean, it's great to win, period," James told reporters, via ESPN. "Listen, coaching staff put us in a position to win, and it's up to us to go up and execute. The Lakers are under pressure after signing James during the offseason, but they are still trying to figure out their starting line-up and how to mesh on the court with the veterans and young core. Based on how the Lakers played against the Blazers, Walton is optimistic the team is growing and developing in the right direction. "It just shows that what we're doing is working," Walton said of beating the Blazers for the first time since March 2014 on the back of 28 points and seven assists from James. "It's tough to get a win in Portland [even] when they don't have a good team. When they got the team that they have right now, it's even more challenging. So you don't just come up here and get hot and beat Portland. James added: "Great to snap that [16-game losing streak against Portland]. They're a very good team, obviously. To beat Portland, you can't just come in and win without playing really hard and really well." The Lakers are at home to the Toronto Raptors (8-1) on Sunday.